Millions of miles have been traveled along this route. The path I run on is an old rail trail that has been converted into a footpath. The markers have been left in place and I love that, both as a way to mark my own mileage, and because they make me think of the history of this place, all those trains, people, cargo, that have been here before me, all their stories, the lives and loves and loss and possibilities. My mother’s father, my maternal grandfather, was at times, a hobo. This same track continued on into the town my mom grew up in and passed through an area near their backyard. She has told me stories about him, and the other men he sometimes brought home from the train. Bapa, as we called him, was also a drunk, in the very old-fashioned sense of the word, before they were called alcoholics. He was the Wild Irish Rose in a paper bag kind of drunk, and we didn’t see him much when we were growing up. He wasn’t a nice drunk, he was a mean drunk, and for that reason my mom kept him away from us most of the time. He died when I was quite young, but the strongest memory I have of him is a day when he came over and sat at our kitchen table with his booze and he did get drunk, but not mean, and then my mom and the four of us kids had to help him upstairs to the bathroom. There are fourteen steps, and we went up two, down one. It took us about an hour to get him all the way to the top and by that time we were all crying tears of laughter at the things he was saying, and because we didn’t think we would ever make it to the top. My other memory of him is that he always said, “Capiche?” after he told me something. And while I had no idea what it meant at the time, I somehow loved that he said it. So I think of him when I am on this trail, wonder if he passed by this way, what stories he could have told about the people he met, the places he went, how he became the person I knew. 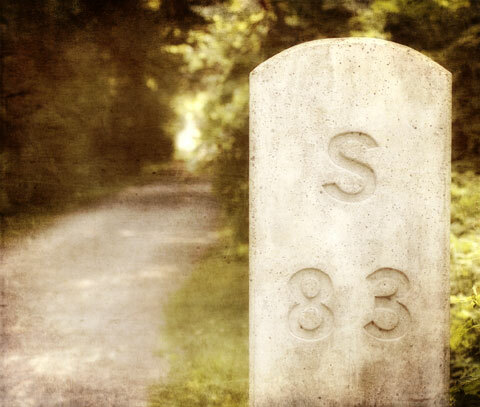 I wonder how many times he passed this marker that says South 83 and thought that soon, he would be home. My father’s father, my paternal grandfather, was among many other things, a well witcher. 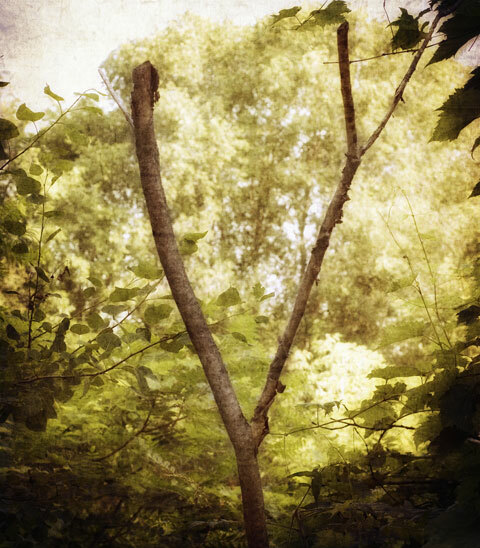 If you don’t know what that is, it means that he could take a divining rod, most often a Y-shaped tree branch, and find a well, deep underground. I never saw him do it, but my dad has, and he says that Gramps really could find water this way. This is one of those things that some people believe in and some people don’t, but I choose to believe that he could do it, that there was something special about him, this part of his legacy. He was a tiny man, barely five feet, and always hunched over because he had polio when he was young. He probably didn’t weigh much more than a hundred pounds. But he was a tough old man, he worked his whole life on a farm, hard labor. He was always working, always fixing something, always in his work clothes. I don’t have too many memories of him either, he also died when I was fairly young. But I remember that when he and my grandmother visited, he always brought a paper bag of candy. He was kind, and gentle, and quiet. He was an old-fashioned man, a country man, a man who made do with what he had, who never got rid of anything in case he might need it one day. He was a man who could find water with a stick. And I think of him too, now, when I am on this trail, and I keep seeing all these Y-shaped branches. The trees along this path, that fold their arms above me and around me as I move through them, are trees that might have been saplings back then, when my grandfathers were alive. telling stories of those who’ve been here before me. And I listen. I always listen. This entry was posted on Tuesday, July 6th, 2010 at 11:25 amand is filed under . You can follow any responses to this entry through the RSS 2.0 feed. You can leave a response, or trackback from your own site. Love those last 3 lines. My father’s brother was a well witcher. I saw him do it once. And I believe. God, but you can write. I want all those stories you never got to hear, all those stories people take with them when they go. My grandfather used to carry bags of candy also – always those squooshy little orange slices, Always. My big memory of him. And PS – I believe. maybe sometimes “not many memories” are the best memories we can have…. i love the memories i have of my grandparents…..and would give anything if my maternal grandmother was still alive. It’s wonderful that you live in an area so full of your family’s history! Both of your grandfathers sound like amazing men and I wonder the path your mom’s dad took to get him to being a drunk. i love this. i love how the past, and our memories of the ones who have walked the paths before us, shape our lives. a well witcher came to my grandmother’s property over 100 years ago to find water. once again, i forgot to change my links (i always notice AFTER i hit submit! )…one of these days i will get everyone updated! I loved reading this post. It was heartwarming. It’s good to take time and listen to those whispers sometimes, isn’t it? I love how you write. It’s like your heart is overflowing on the page. What a wonderful post, thank you for sharing such wonderful memories. Enjoy your runs.